Dash Cam video has been released that shows police shooting and killing an unarmed man by firing nine rounds into his car after he was the victim of a minor car accident. Fairfax County, Virginia – Dash Cam footage has just been released that shows police shooting and killing an unarmed man they claimed was responsible for a hit-and-run. However, the man was actually the victim of a traffic accident and the newly released video shows that he then became the victim of murder by police. Bijan Ghaisar, 25, died 10 days after he was shot in the head three times by U.S. Park Police. The incident began on Nov. 17, 2017, when Ghaisar was rear-ended by an Uber driver, and although he was the victim of the accident, he left the scene. While police have attempted to paint this situation as one in which officers were chasing a dangerous suspect who was putting their lives at risk by evading their attempts to arrest him, Ghaisar’s family told a very different story. “Bijan Ghaisar was repeatedly threatened by over-aggressive and out-of-control law enforcement officers after he drove away from a minor traffic incident in which he was the victim and in which there was little property damage and no known injuries,” the family told NBC Washington in a statement. The police department has not said whether the officers who were attempting to apprehend Ghaisar knew that he was the victim of the accident that was reported by the Uber driver. While an armed Park Police officer can be seen banging on the window of Ghaisar’s car, it is also not clear what directions the officers were giving him at the time. However, it is clear that the officers were becoming increasingly frustrated with Ghaisar. He continued to drive away and was followed by both Fairfax County and U.S. Park Police officers. When Ghaisar stopped at a stop sign, a police cruiser pulled in front of his car to block it, and two officers approached him with guns drawn. As Ghaisar’s vehicle began to move forward once again, two of the U.S. Park Police officers fired nine shots into his vehicle—three of which struck him in the head. Ghaisar was taken to the hospital where doctors determined that he had suffered severe brain damage, and he was pronounced dead 10 days later. Fairfax County Police Chief Ed Roessler released a statement announcing that the FBI is currently investigating the shooting, and the dash cam footage was released to increase transparency. 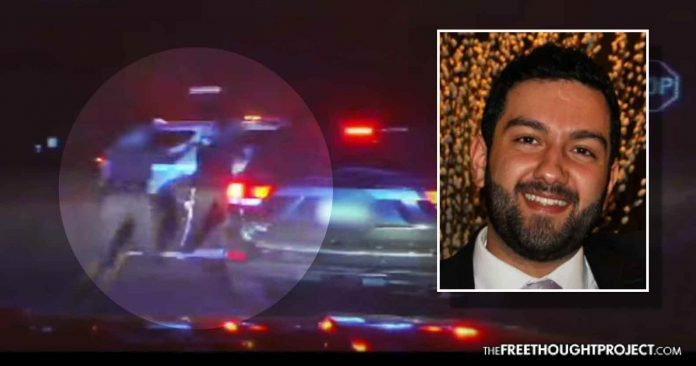 The McLean Patch noted that “Park Police wouldn’t comment on why there was a pursuit for a car that had been rear-ended in the first place,” and that after reviewing the evidence, a lawyer told the Ghaisar family that “it is even more clear that the killing of Bijan Ghaisar was completely unnecessary” given the original crash. Bijan Ghaisar was an accountant, a resident of McLean, and he graduated from Virginia Commonwealth University. His family has maintained that he was unarmed at the time of the shooting. The two U.S. Park Police officers who are responsible for the shooting are now being treated to a tax-payer funded vacation, also known as administrative leave.